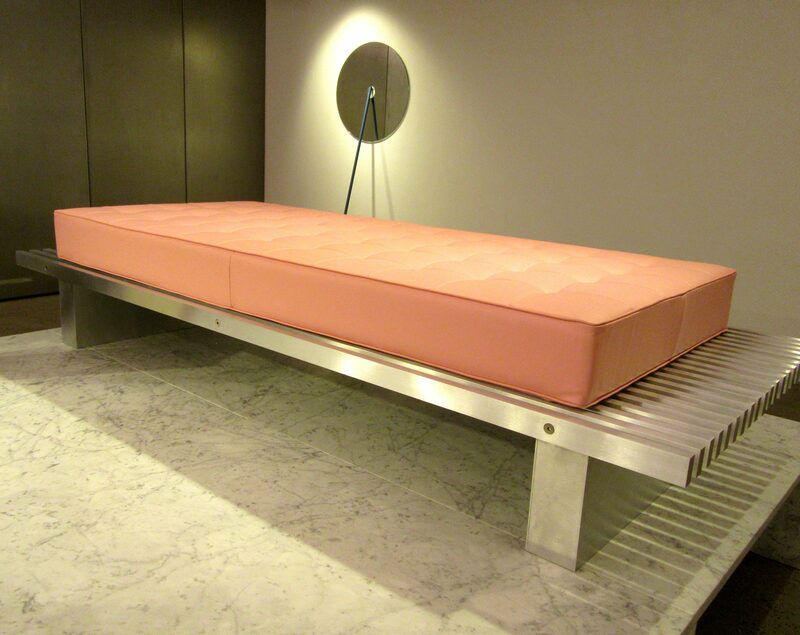 When I first saw this minimal-yet-gorgeous modern Daybed, I thought I might choose it as a Pink Thing of the Day, but ultimately its functionality swayed me towards the week’s featured design post. 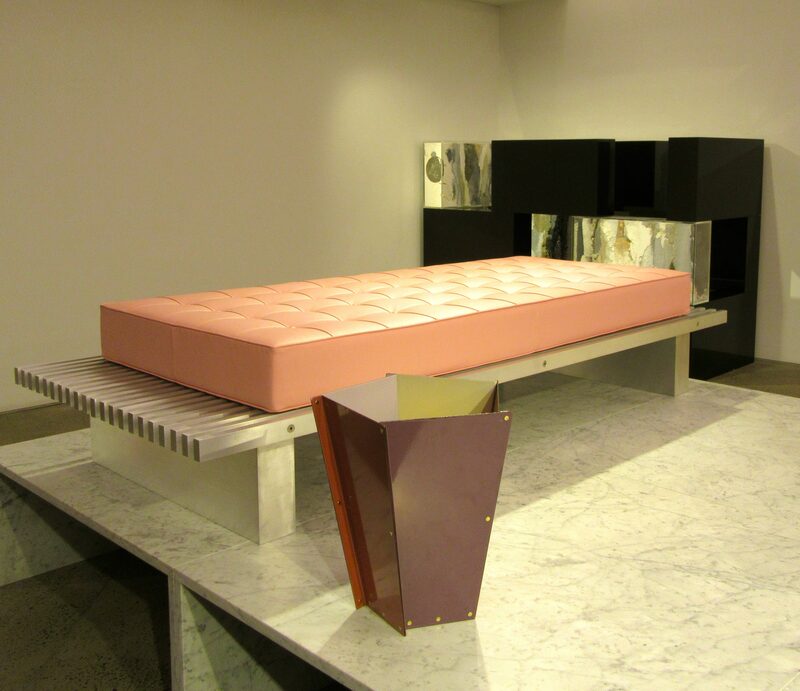 Spotted as part of Chamber Boutique’s latest collection, Berlin-based design practice New Tendency has developed a daybed made from honed stainless steel and hand-selected, pure vegan tanned leather. 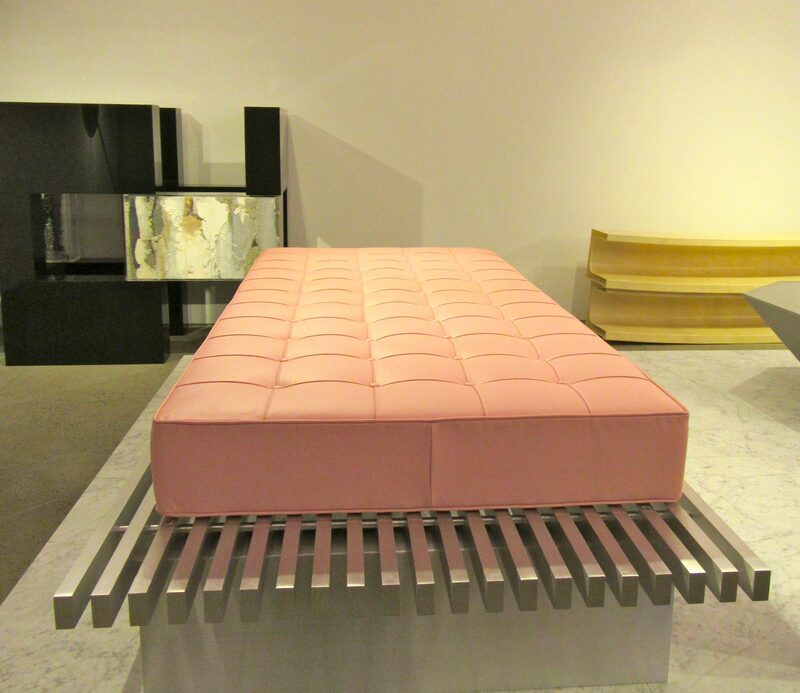 I’m not sure if the cushion is available in other colors, but I think the pale pink looks just perfect against the silver-toned, brushed metal finish. You could build so many looks around this piece. 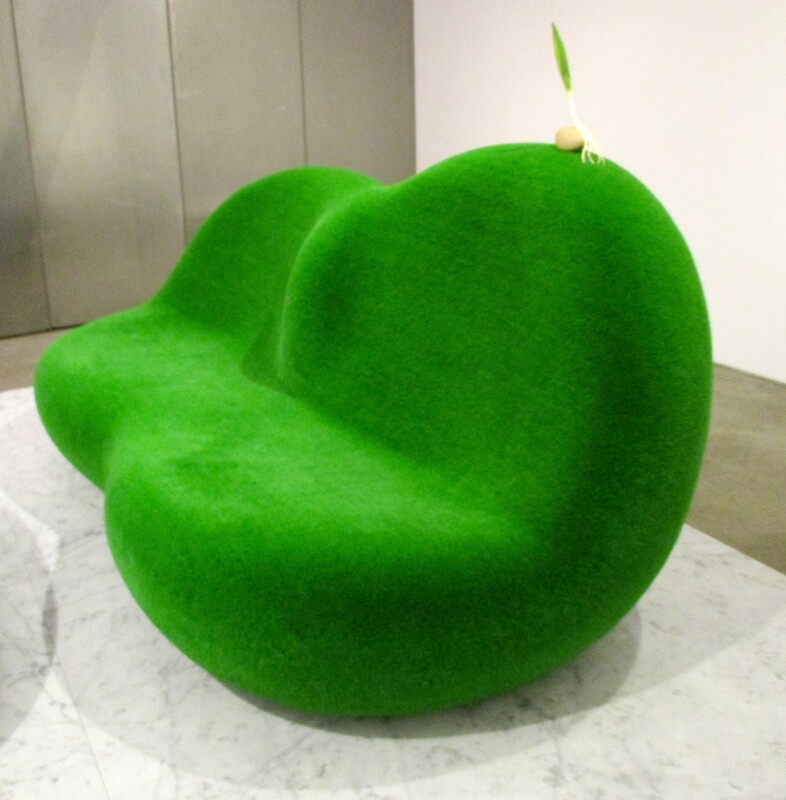 New Tendency applies modernist design principles onto the everyday contemporary objects. In Bauhaus tradition, they create products characterized by conceptual design, clean aesthetics and functional form, all handcrafted in Germany. The collection of furniture and accessories develops under the creative direction of Manuel Goller, and consists of original products developed with associate Sebastian Schonheit, as well as collaborations with selected designers and architects such as Clemens Tissi, and others. 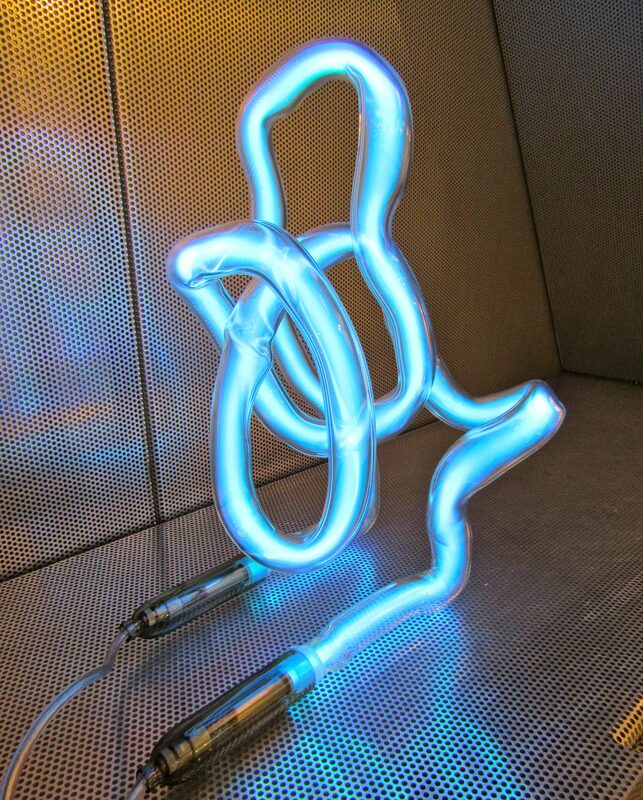 A couple of weeks ago, we made a run by Chamber on West 23rd Street to check out their newest collection of functional, limited edition artworks and home goods. As usual, more than a few items piqued our interest. 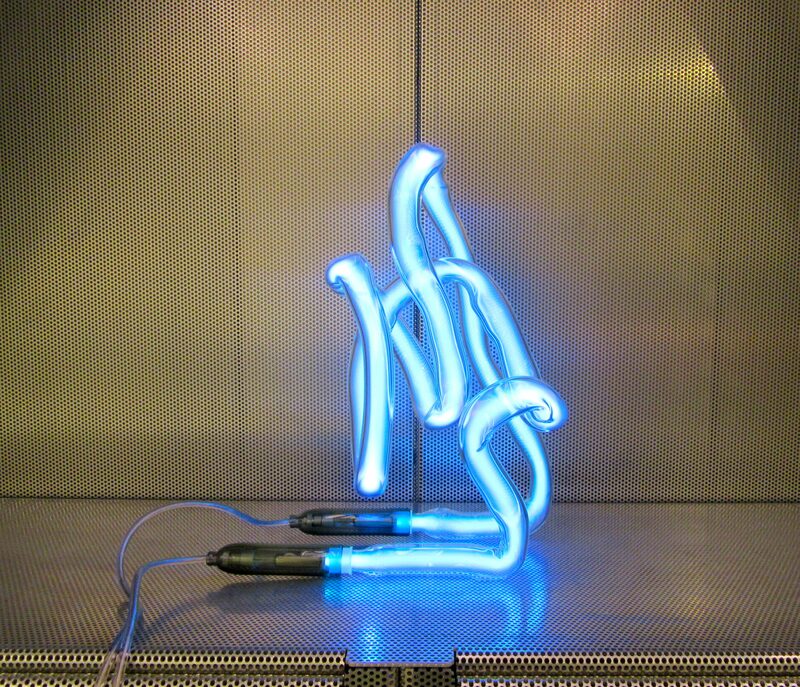 We especially like this lamp by London-based blown glass artist and designer, Jochen Holz. This fun modern lamp also comes in Red. Contact the store at info@chambernyc.com for pricing. Photographed at the Chamber Boutique on 23rd Street, West of the High Line / 10th Avenue. “This invention relates to educational devices, and has particular reference to an apparatus for facilitating the observation, study and photography of subterranean life, especially the life and habits of insects and smaller animals who live underground.” So began Frank Austin ((1873 – 1964)’s application to the U.S. Patent Office, filed on June 21, 1929, for his storied Ant House (also known as the Ant Farm). Photographed in Chamber Boutique on 23rd Street, West of 10th Avenue. Azuma Makoto is a florist and botanical artist, known for incorporating nature into his fantastical and often surreal work. 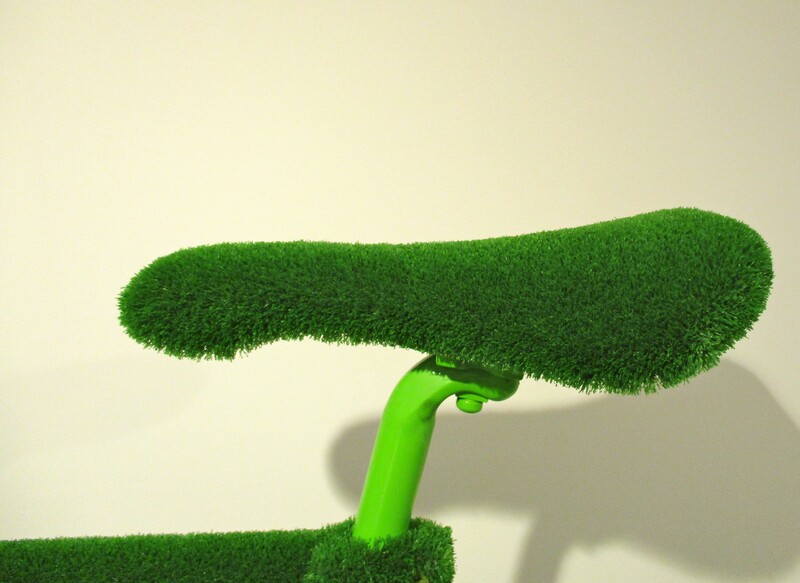 This Bicycle, from the artist’s Botanical series, is covered in AstroTurf, but still functions as a ride-able bike. 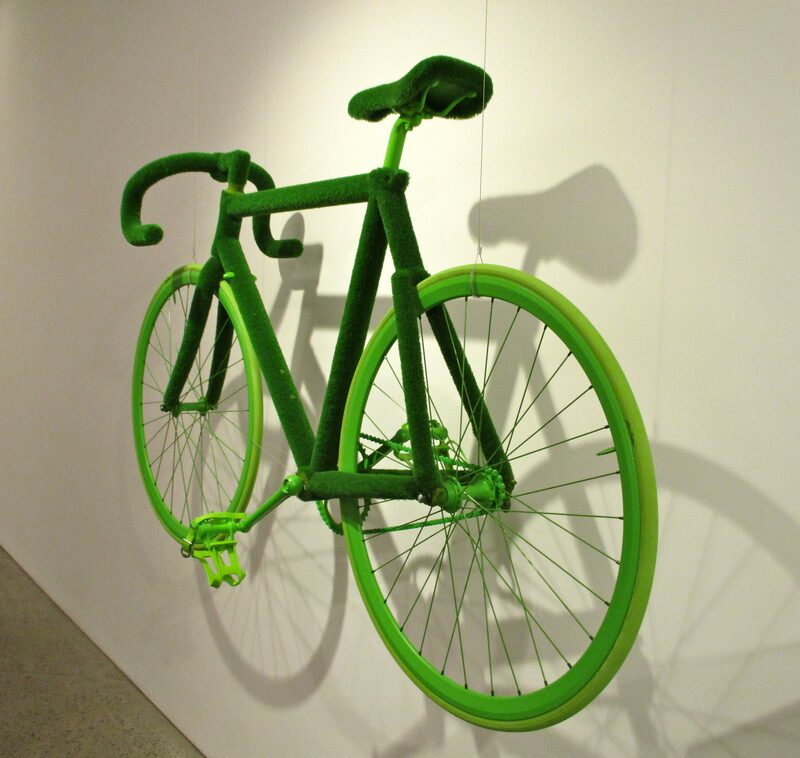 Each Bike is unique and sells for about $5,000. 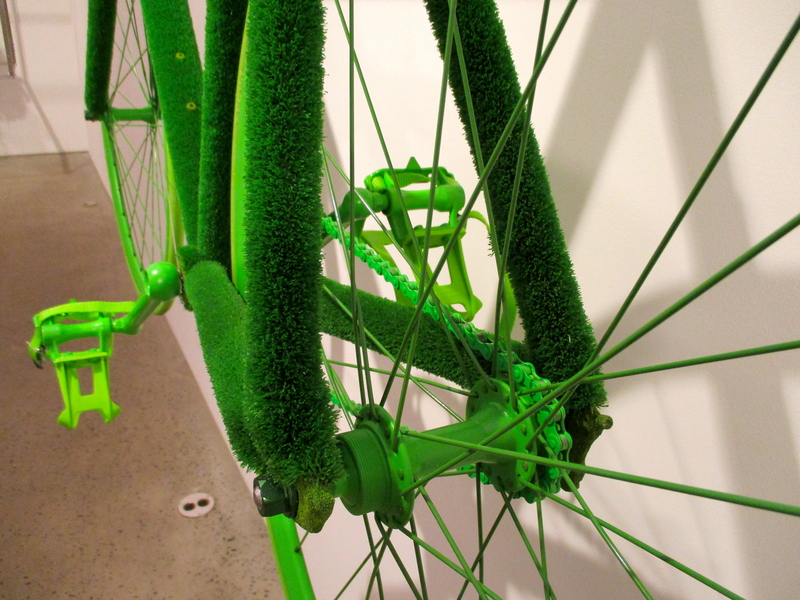 Botanical Bicycle By Azuma Makoto is on Display Through April 30th, 2016 at Chamber, Located at 515 West 23rd Street, in the Chelsea Gallery District. 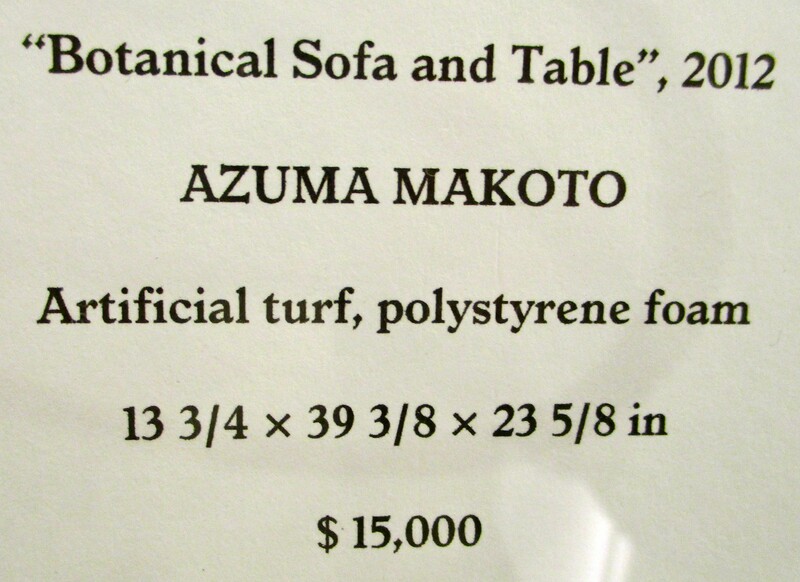 Chamber home design boutique and gallery on West 23rd Street is currently hosting a selection of new creations from botanically-minded Japanese artist Azuma Makoto. 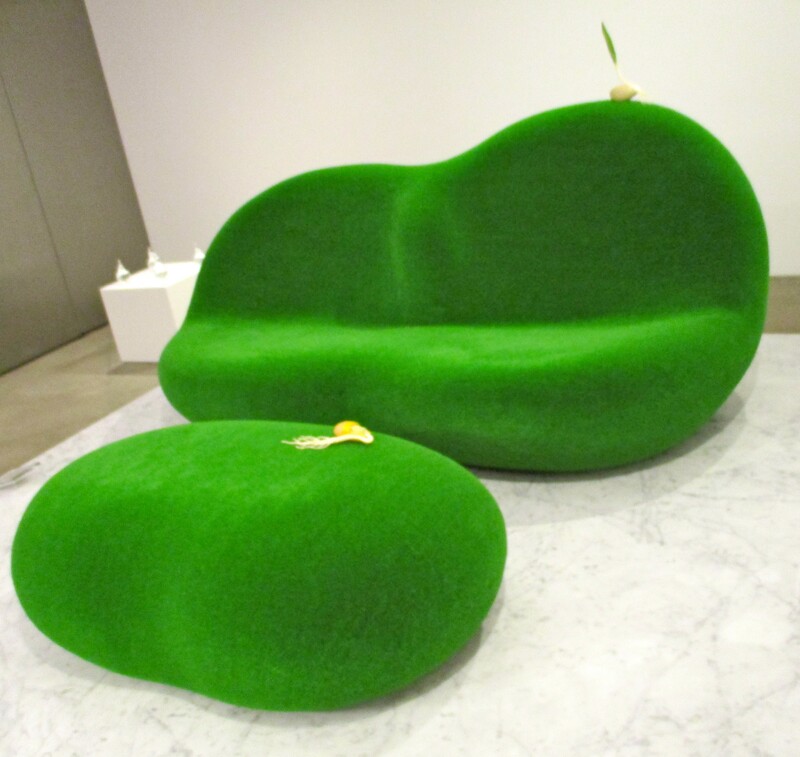 We especially love this bean-shaped Sofa and Table set covered in vibrant green AstroTurf! 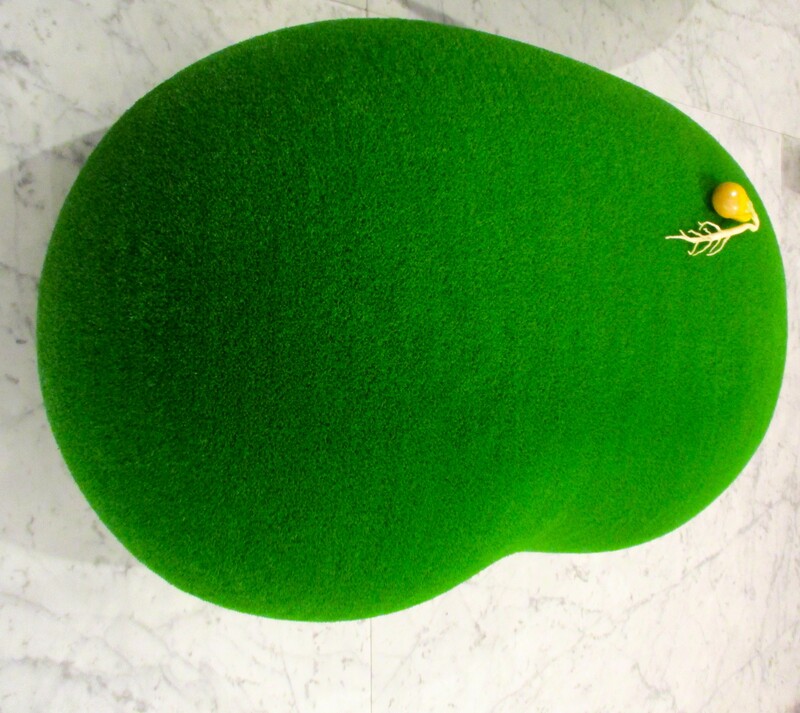 Talk about successfully bringing nature indoors! 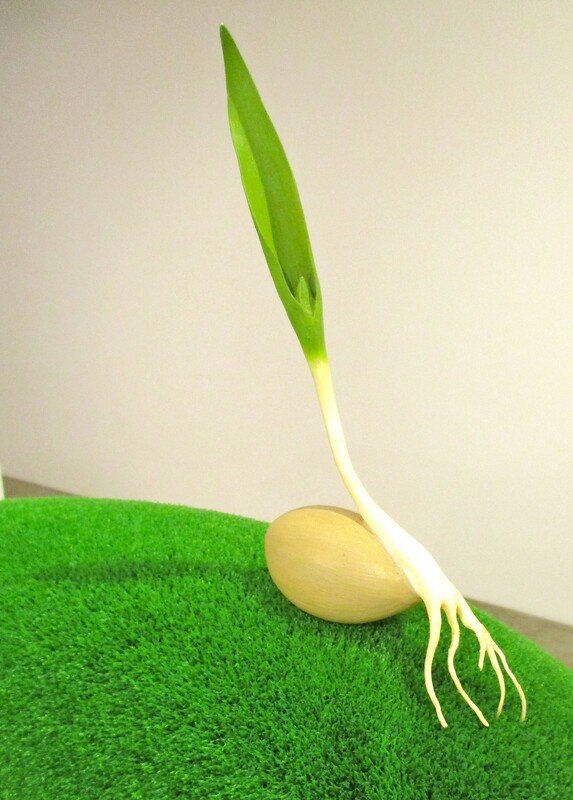 Each piece has what looks to us like a single, sprouted Leek bulb accent. This makes more sense when you see some of the other objects designed by Makoto, such as an array of crystal glass boxes shaped like seeds, sprouted bulbs suspended in acrylic cubes, and a tabletop collection of fungi dipped in precious metals, all of which are available in the boutique through April 30th, 2016. 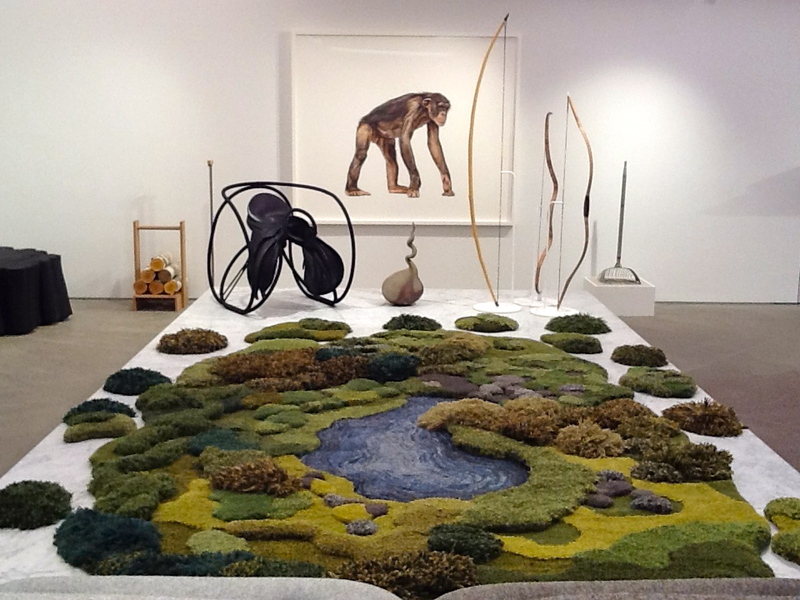 Chamber is Located at 515 West 23rd Street, in the Chelsea Gallery District. 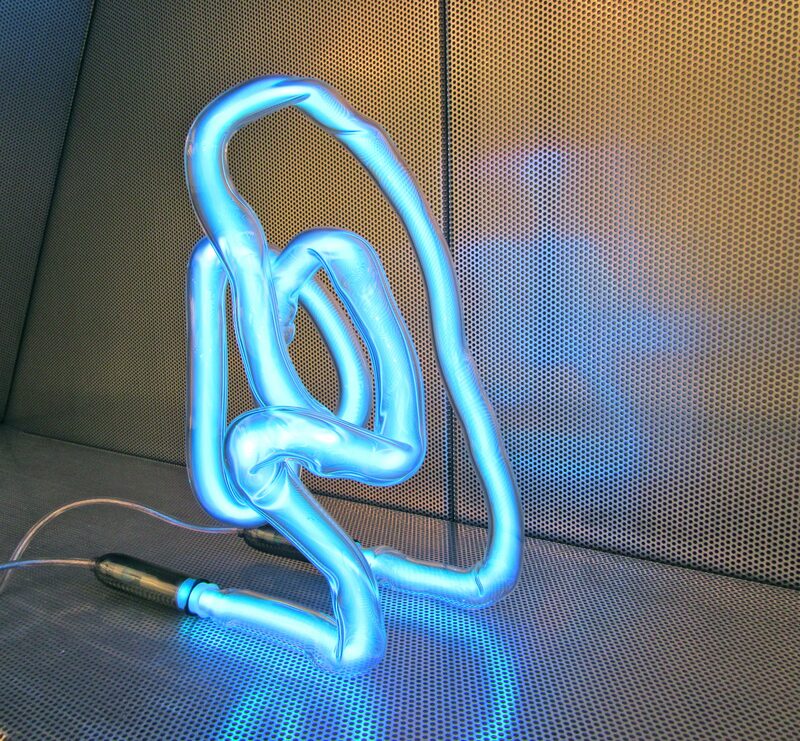 This Image Source. All Other Photos By Gail. It had been a few months since my last trip to Chamber when I popped in last week before an opening and found the store has all new merchandise! New Stuff – Yay! 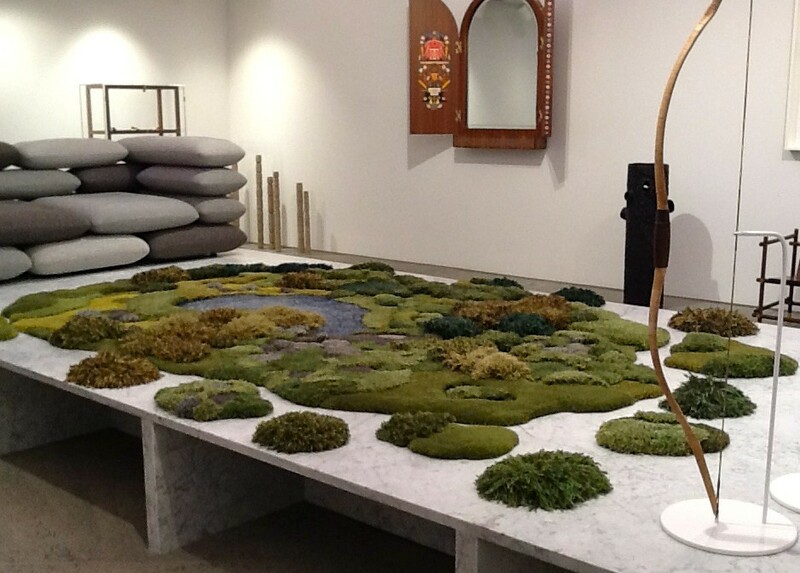 Of course, it was hard to miss this amazing, one-of-a-kind carpet by designer Alexandra Kehayoglou, which — as you can see by my photos — is definitely the focal point of the stores’ main showroom space. 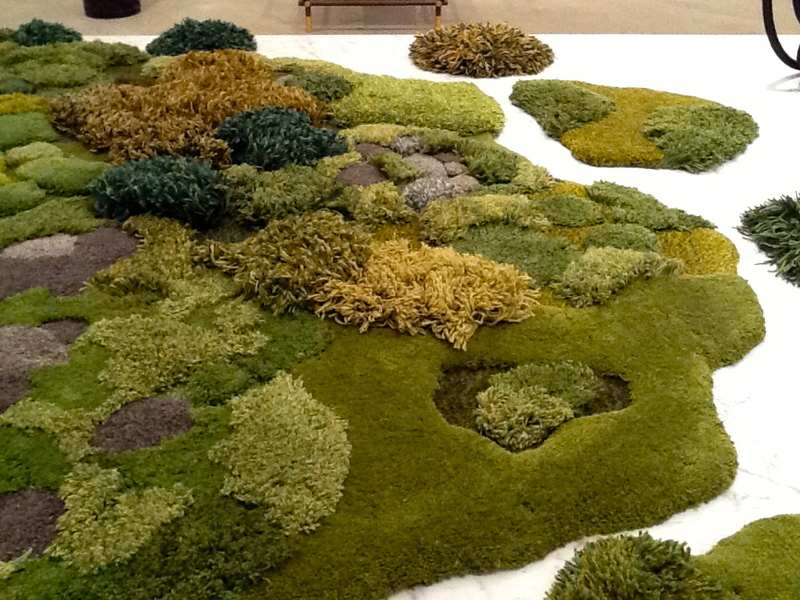 When I first walked up to this carpet, I thought it was actual clumps of moss spread across the display, because it looks so real. Imagine how much fun it would be to roll around on or to walk on with bare feet, but not, necessarily, to clean or vacuum. To create the Pastizal carpet, Kehayoglou wove the textile with a hand-tuft system using a pistol that the artist manipulates on vertical racks, creating the weft that will give shape to the final piece. 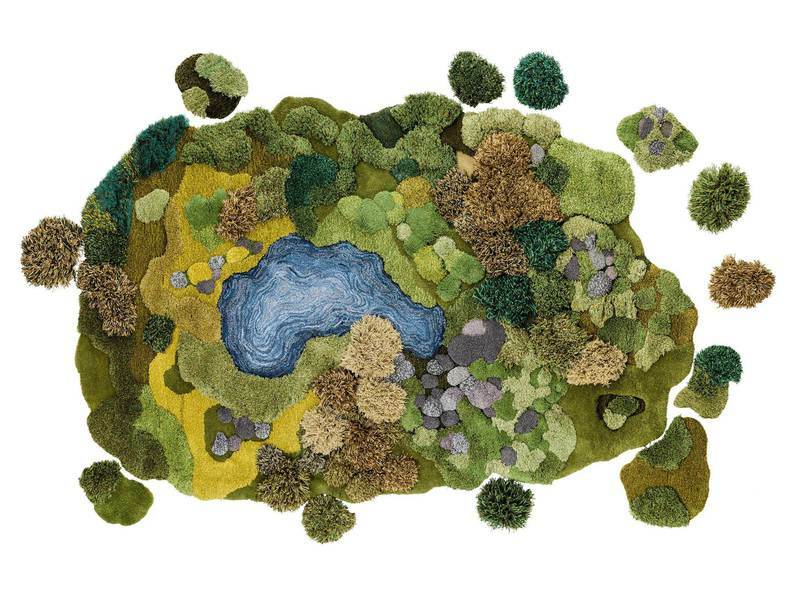 Kehayoglou creates unique carpets after visiting different native landscapes. 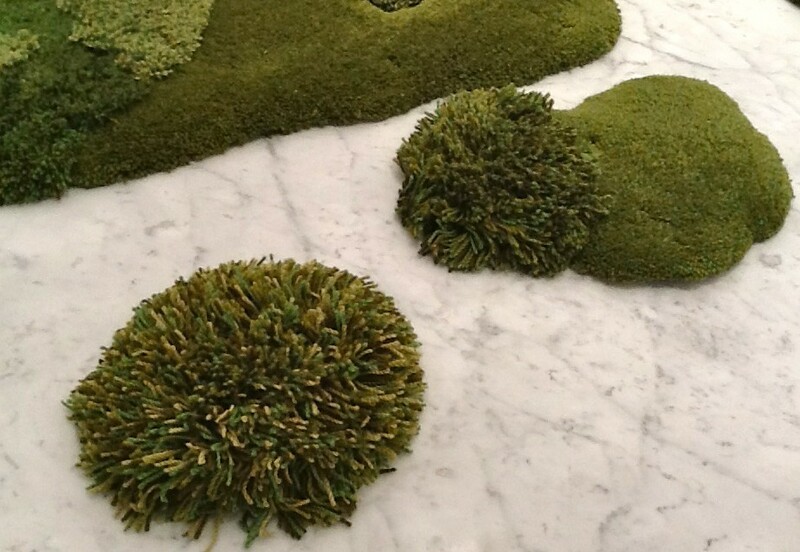 The carpet comes with lots of these little green guys as well, that I imagine you could arrange as you see fit, and sort of change it up. 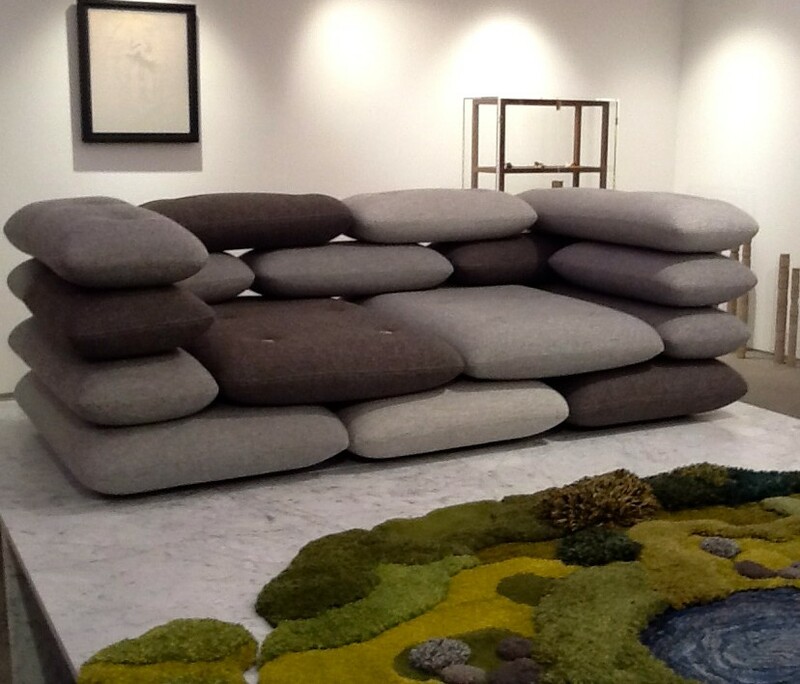 Here it is with what they call the Brick Sofa. Contact the store for pricing. 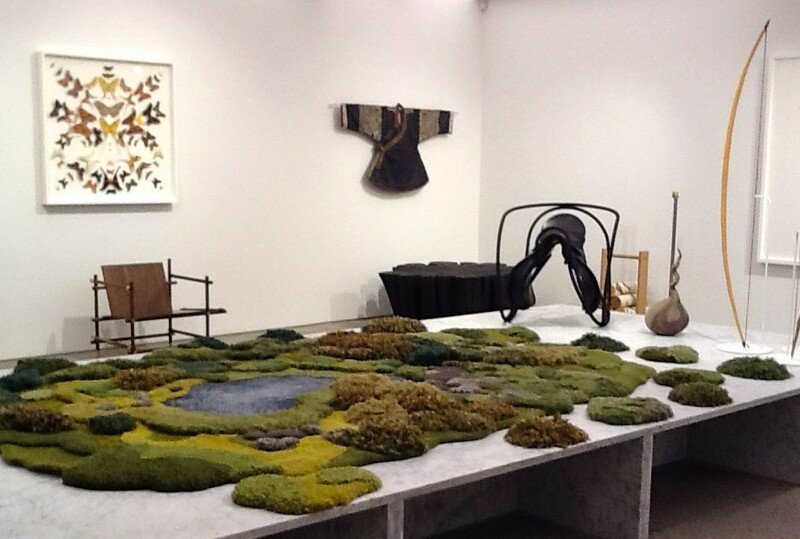 Chamber is Located at 515 W. 23rd Street, in the Chelsea Gallery District. Hours are Tuesday – Saturday 10:00 AM – 6:00 PM. Visit them online at Chamber NYC Dot Com. 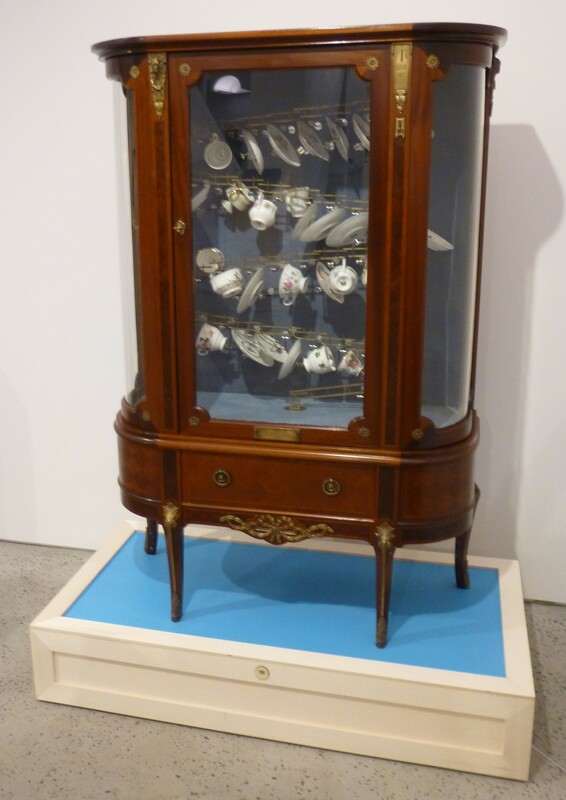 Not My Cup of Tea follows Splendour Lender, a cabinet which addresses the Dutch tradition of displaying one’s porcelain in a “Pronkkast” as a symbol of status and happiness. A coin, inserted into either cabinet, rolls down the porcelain, producing an enjoyable melody. 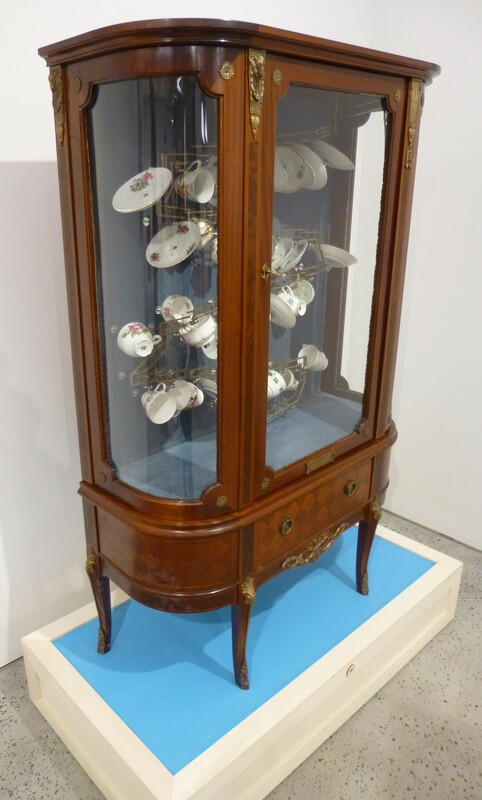 In contrast to Splendour Lender, which holds a collection of porcelain, this cabinet contains identical cups and plates. While the cabinet alone encapsulates abundance, the meaning behind the phrase “Not My Cup of Tea” suggests discrimination. After each usage, the coin is returned, which would usually happen when a product is defective. The repetitious cups and their tunes show the universal cycle of consumption, the financial greed of modern times, regardless of difference in taste. 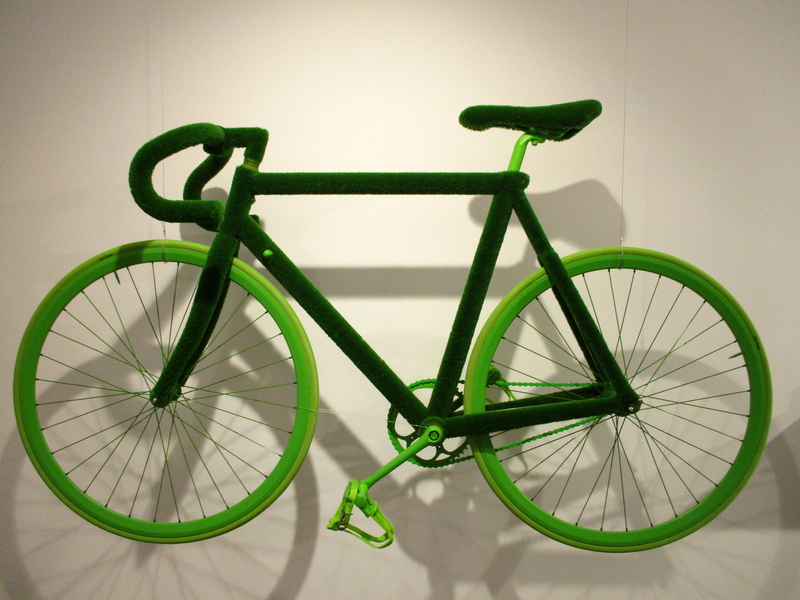 Created by Designer Jelle Mastenbroek, Eindhoven, Netherlands. 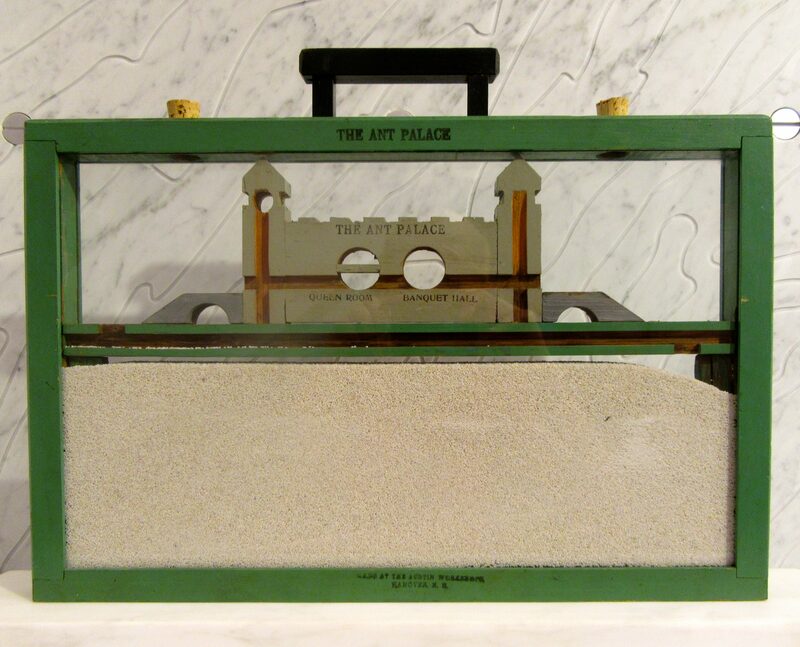 Available at Chamber, Located at 515 W. 23rd Street, in the Chelsea Gallery District. Hours are Tuesday – Saturday 10:00 AM – 6:00 PM. Visit Chamber online at Chamber NYC Dot Com.